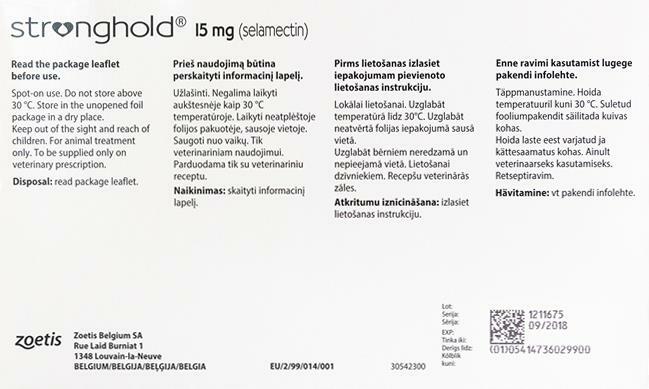 Stronghold for puppy and kittens prevents heartworms, fleas and other harmful parasites. What's the minimum age/weight for this product? Minimum age is 6 weeks old for puppies and kittens. Is any difference between Revolution and Stronghold? They are literally identical products from the same manufacturer branded differently for different markets. I finally received my cat's stronghold. I was worried because it was like 21 days till it came. I used it and it is wonderful! I will order again but did not have automatic reorder because I think my next order he will be a full grown cat, not the under 5lb formula. I will tell friends about you. My only problem was the PO code would not go in the order and I was told to use a fake one by Elmer and then my confirmation email had the fake one so I worried till I got the product. Other then that, it was a pleasure using your company and it is a great product.